This topic contains 297 replies, has 89 voices, and was last updated by randr 1 minute ago. Kinda new to this so any help will be great! You need the latest contoller.vbs and perhaps best to grab the latest 10.2 vp beta. Great table, thanks! Another beauty :). Table looks and plays awesome. I don’t have any big problems, hitting the shuttle ramp. I think it works really nice. Awesome wrd ! Had a bit time to Play … wuff, very cool ! Thanks also dark, and all involved ! Is there a reason, why you use _7 Rom against _8 in your Script ? I think this table moves to the top of the list for best looking VPX tables… it is like looking at the real thing… amazing! Ok guys an update is in the works. I located a real BOP and gained some very valuable experience on how it plays. First off, the shuttle ramp is playing very similar to the real thing. So no major physics changes are needed. One other thing I noticed is that the real machine was playing noticeable faster than the VP table. So I have added more slope to the table to speed things up some. Also sped up the ball in the crossover ramp a bit. One issue I have been fighting is inconsistent slingshot kicks. Seems the ball would hit a sling and not activate on a frequent basis. This was due to using a collidable rubber and the sling wall was somehow butting heads with it. I have made the main rubber NON collidable and added two additional walls to form the perimeter of the sling. So with only the sling wall on the hitting side, it is playing a ton better. This issue was greatly affecting gameplay IMO..but now its fixed. JP’s ball rolling sounds have been added. Will add the shooter ramp sound soon. Numerous small visual tweaks plus a missing GI light under the shuttle ramp. Thanks again for all of the compliments and support. And expect an even better playing table very soon. Getting real close to releasing an update. Need some help on a few things from some scripters. 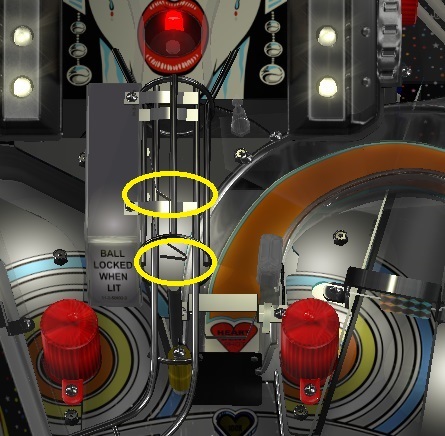 The two animated switch arms in the ball lock area, are not remaining moved when the ball or balls are parked. They move initially but return to their normal position in the middle of the parked ball. Will someone please send me the required sripting to fix this? I have a trigger just before the shooter lane wire ramp. 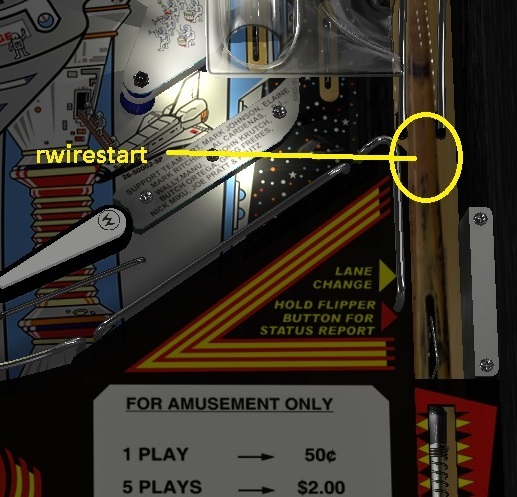 It is call “Rwirestart” and it is used to play the wire ramp rolling sound. When the ball comes down the cross-over ramp and reewnters the shooter lane to be plunged again. It is hitting this trigger and playing the wire ramp rolling sound when it should not. I need the “Rwirestart” somehow linked to the SW52 so that the only time the sound plays, is during a plunge. In other words, I need “Rwirestart” to only activate with forward ball motion. Aren’t we all a little nuts? Yeah your nuts! But that’s good for us! I was about to say the same exact thing. Way to go, wrd. Hey wrd… I was just thinking, and I don’t know how do-able this would be or if you would be interested, but if you did an apron thing for the top “three flashing lights” sign, kind of like mfugemann did for Junkyard, a person could stretch the table a little closer to aspect ratio correctness (not needing to keep the top sign visible on the screen). Just thought I would throw it out there as an idea. Feel free to disregard. Hey wrd… I was just thinking, and I don’t know how do-able this would be or if you would be interested, but if you did an apron thing for the top “three flashing lights” sign, kind of like mfugemann did for Junkyard, a person could stretch the table a little closer to aspect ratio correctness (not needing to keep the top sign visible on the screen). Just thought I would throw it out there as an idea. Feel free to disregard. I would do this only if it were a switchable option in the script. If some one wants to script it, I will add it to the table. Okay, next release is ready except for the two scripting issues I mentioned a few posts back. If someone can help me fix those two issues, I will release the update today. Getting real close to releasing an update. Need some help on a few things from some scripters. I don’t see Rwirestart, maybe I don’t have the latest version, but you can add the conditional logic of “if activeball.vely < 0 then” to only call the sound it if the ball’s going up. Actually, it looks to me like it’s not waiting for the unhit. The timer moves it and then snaps it right back. Let me do some testing and if I can figure it out, I’ll PM you the fix.